Yer a riding mule, Xato! I had my first ride on Xato just over a fortnight ago. 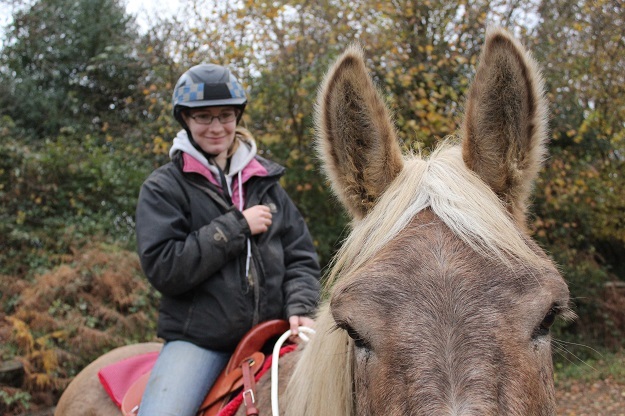 It was so awesome to finally be sitting on my mule! 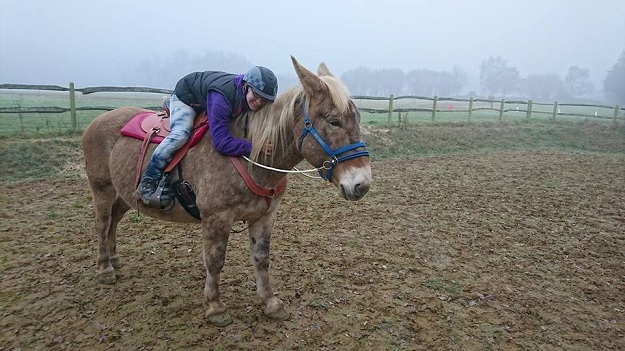 That first session was really nothing more than a pony ride, as Ben led me and I think Xato was probably paying more attention to his handler than any signals I was giving him. But it was good for both our confidence. 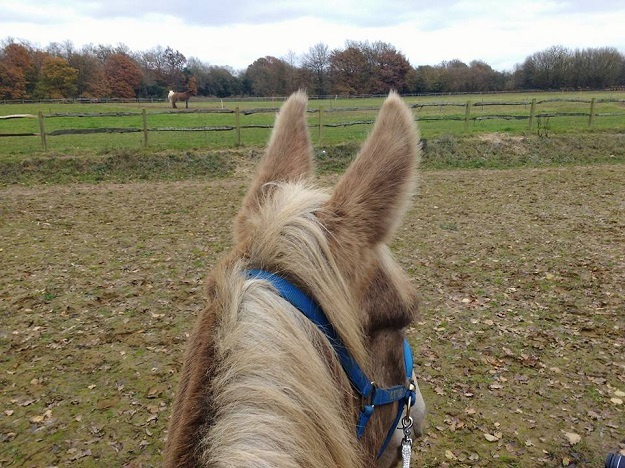 This is the first “through the ears” photo I’ve taken, from the back of my own equine, in five years. I have been waiting so long for this moment! Since then, he has just been getting better and better every ride. 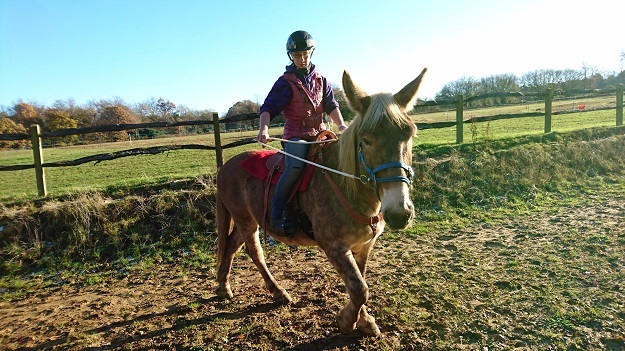 We spent a lot of time working on groundwork before ever saddling up, as when he arrived he had a tendency to lean on the rope and go where he felt like. His mind just wasn’t with us at all, and I strongly suspect that was all anxiety from being uprooted, taken to this weird place, and then having some weird woman start making all these demands of him! Poor boy! 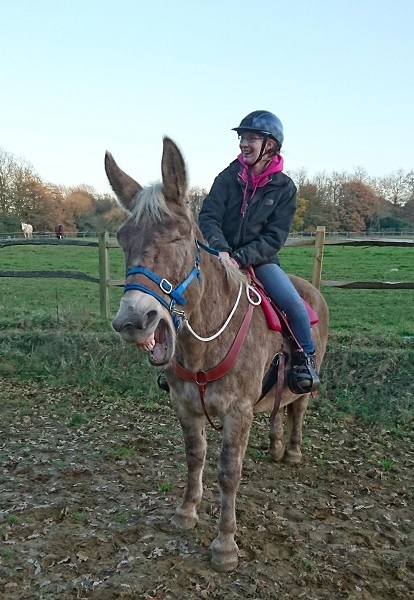 He was also quite worried by me jumping up and down beside him, so we did some work on that too as well as practicing lining up on a mounting block. Asking wide to try and encourage him to tip his nose and follow the bend. This is easy-peasy, he says. 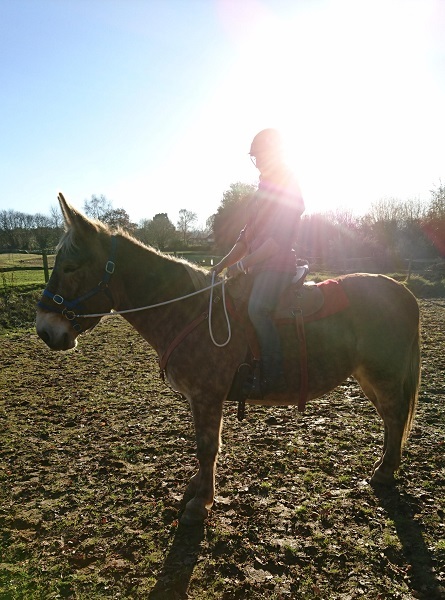 This morning I’d asked Ben to give me a lesson before he went to work, so I got up early in order to get morning chores done and have Xato tacked up and ready by the time Ben arrived. 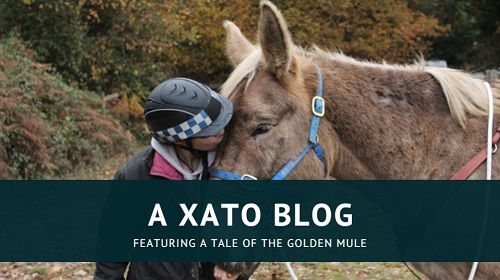 We had done our groundwork – practicing our leading, our circles and our disengage – and Ben still wasn’t there, so I asked Xato to line up on the block a few times. He was feeling really good, and I just thought – why not? So I hopped on. It was the first time (with me) that he hadn’t had someone standing by his head, but he stood perfectly and let me find my stirrup and rearrange myself before I asked him to move on. He wasn’t so sure here. I don’t blame him … I did question whether tie-dye jeans really go with a purple hoodie myself, but by that point I was halfway out the door and figured it was too early to care. 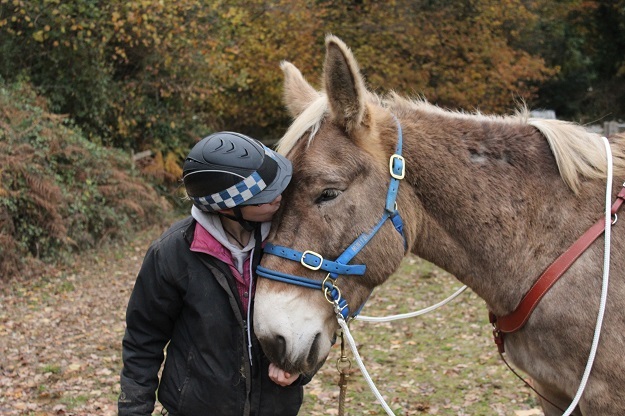 I’ve often heard it said that mules learn really quickly and will just continue to improve from one day to the next once they understand something, but I hadn’t really seen it with Marty. Marty’s way of operating mostly saw him fluctuate between really good and really, really bad – there never seemed to be any rhyme or reason to it. Some days I’d feel I’d made progress, and other days it was like I’d taken twenty steps back, fallen down a hole and landed in something gross. You can probably imagine how demoralising that was! This isn’t to say that I don’t imagine Xato will occasionally test me like that. 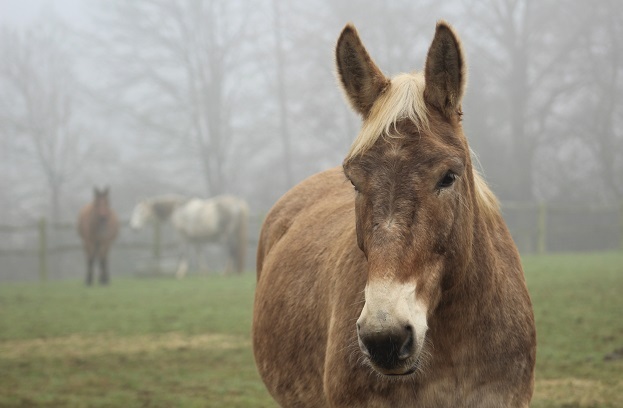 I’m sure we’ll have plenty of days where I question why I thought owning two mules was a good idea! But it is very nice to see actual improvement every time I work with him. He has had some amazing work put into him before he ever came near me, and as we understand each other more I am getting better at figuring out how to ask for things. Even his white line disease is improving after only two weeks of treatment! Is there nothing this mule can’t do well? !